This fall, New York City schools are launching a program that will move special needs students into general education classrooms, limiting the use of “self-contained” classrooms that cater only to students with special education needs. Education officials say that the move is intended to boost students’ performance by bringing them into closer contact with their peers, and also make life easier for families by bringing students closer to home. For the first time, all New York City schools would be required to accept special needs students. Critics of the move suggest that the real intent is to save money, since self-contained classrooms for special education students are smaller and require instructors with additional training. Under the new plan, these self-contained classes would no longer have the guarantee of full funding. In addition, these critics say, the change may not be in the interest of students, as two problems may arise: special needs students may not be able to have their particular educational needs met, and the change may cause disruption in general education classrooms, affecting the performance of all students. Department of Education officials denied that the move was motivated by financial concerns, saying that it may end up costing more in the long run. The goal, according to officials, is to offer better educational opportunities to special education students, fewer than 31% of whom graduate from high school in four years. Officials said that special needs students who spend their entire school career in self-contained classrooms have only a 5% chance of earning a diploma. Department of Education officials said that although the change is large-scale, it will be rolled out gradually. In the 2012-13 school year, only children enrolling in kindergarten, or sixth or ninth grade would be affected. Most special needs students would spend only part of their school day in general education classrooms. Under a proposed change in graduation requirements for students with disabilities, a set of less-rigorous exams would be eliminated, but other options would be available for students to earn diplomas. The State Education Department is recommending to the Board of Regents that the less-demanding Regents Competency Tests be phased out beginning with students who started ninth grade in 2011. Advocates of the change say that there will still be a safety net for students with disabilities to earn a high school diploma. While general education students, beginning this year, must score at least a 65 on five Regents exams in order to receive a Regents diploma, other options will be available for students with disabilities. The first option is one currently available to students with disabilities: scoring between 55-64 on five Regents exams. Students may also use a higher score to compensate for a lower one, or choose to replace the difficult Global History exam with an extra math or science Regents exam. Any of these options would earn the student a local diploma, an option no longer available for general education students, who must earn Regents diplomas. In announcing the change, State Education Commissioner John B. King Jr. said, “By moving to require all students to take Regents exams, the board committed many years to increased rigor in high school, but we want to make sure that we accommodate students’ particular disabilities,” according to the New York Times. Students with disabilities who are currently sophomores, juniors or senior will still have the option of taking the Regency Competency Tests (RCTs), if they fail the more demanding Regents exams. In order to earn a local diploma, a disabled student must pass six of the RCTs. 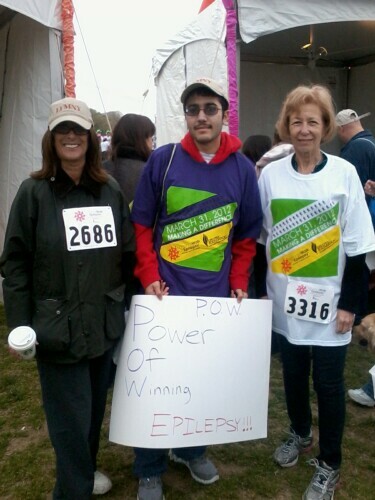 A community event, “Power of Winning,” will be held on May 12, 2012, from 10am to 3pm, to raise awareness of epilepsy, at the Carmel Town Hall in Mahopac, New York. The event is an Eagle Scout project organized by 16-year-old Gil Seda, who has epilepsy. The event is intended to educate the public about epilepsy and “show you the power of winning the fight.” There will be face painting and free raffles, as well as two guest speakers, Dr. Solomon Moshe, the Director of Pediatric Neurology and Clinical Neuro-Physiology at the Albert Einstein College of Medicine, and Adrienne Arkontaky, an attorney with Littman Krooks whose practice focuses on special needs planning and helping families of children with disabilities. The organizer of the event is Gil Seda, a junior at Lakeland High School and a Life Scout with Boy Scouts of America Troop 164. Gil is also part of the Carmel Sheriff Police Cadet program, and a volunteer at Northern Westchester Hospital. In order to become an Eagle Scout, Gil must organize a project to benefit the community. To support Gil’s project and learn more about epilepsy, come to Carmel Town Hall, 60 McAlpin Avenue, Mahopac, New York, between 10am and 3pm. Attendees may also bring children’s books to be donated to the Montefiore Children’s Hospital. To find out more about this event, visit our calendar. For assistance with questions regarding your child’s special needs visit our website at https://www.specialneedsnewyork.com/.